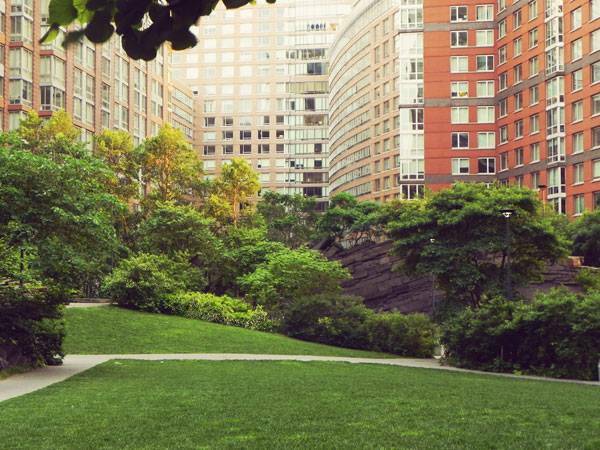 Article by Giacomo Guzzon – Teardrop Park, by Michael Van Valkenburgh Associates, Inc., in New York City, USA Teardrop Park offers a lot in a small package. 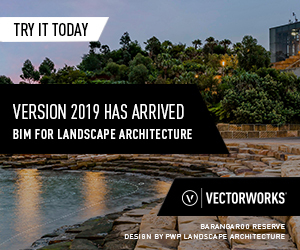 It is a significant lesson in landscape design, successfully integrating issues of materiality, sustainability, spatial differentiation, programming, and circulation. Perhaps most importantly, it demonstrates how a thoughtful design can bring atmosphere, character, and life to even a small, flat, and featureless place. 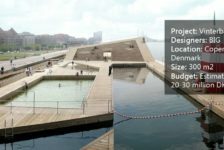 The successful solution of the challenges of the site makes this project an example of great contemporary landscape architecture. 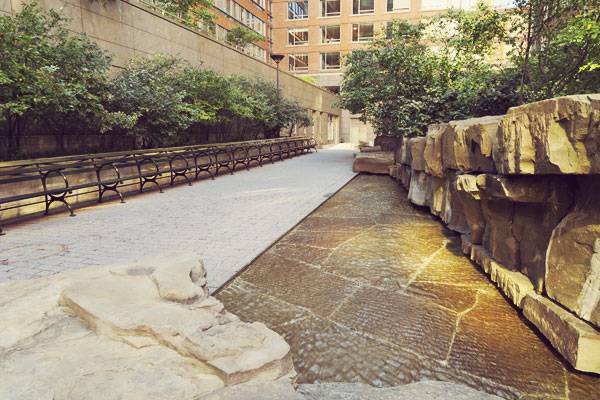 This 1.8-acre public park designed by Michael Van Valkenburgh Associates Inc. sits on an artificial plot of land that was created in the 1980s by filling in a portion of the Hudson River with inert material excavated for the construction of the World Trade Center. 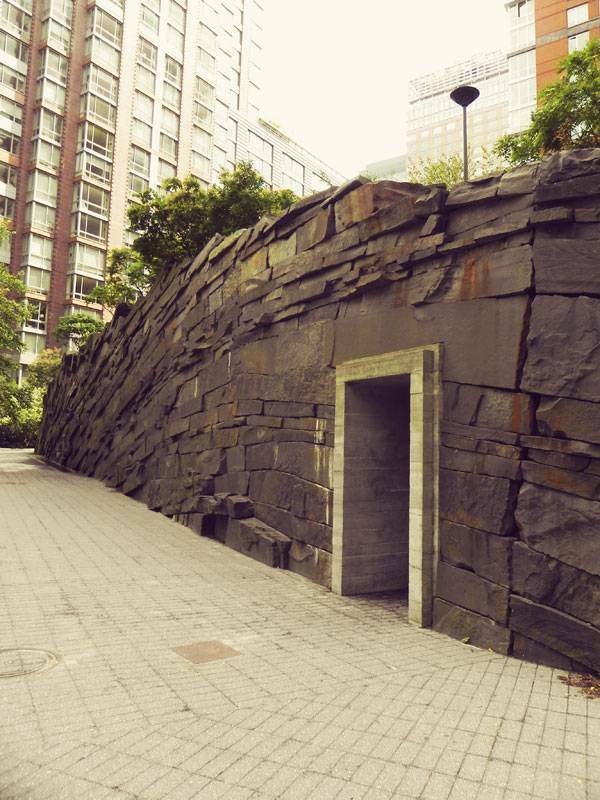 The site is surrounded by high-rise residential buildings and is located within an area of lower Manhattan called Battery Park City. When I visited this park a few years ago, I immediately felt this space offered something very special. I was amazed by how the design could create such a distinctive atmosphere, knowing the site originally had no interesting landscape features. The park is spatially divided into two parts by an over-scale, bluestone ice wall located approximately in the middle. 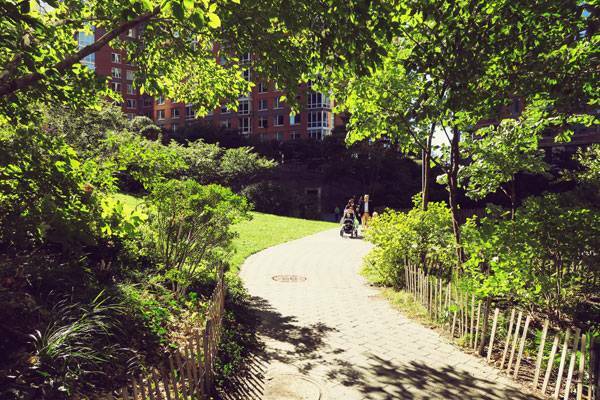 The northern side — the sunniest part of the park — features a south-facing tilted lawn; south of the wall, a series of meandering paths encloses playgrounds. The stone wall has a system that drips water along its façade. During the winter, it creates stunning ice sculptures, adding drama to the experience of the park. Before the park’s opening in 2004, the area was empty and without any natural features. 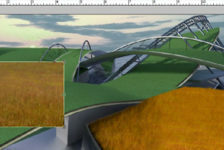 The landscape had to be created from a flat, landfilled surface. The character of the place had to be derived by creating new conditions and using new materials. Bringing new materials to a site means somehow also transporting something of the physical presence and atmosphere of their original landscape with them. For example, the massive rock features that are a characterizing element in the park recall the geology of the Catskills area in northern New York. The rocks are present in different forms: boulders in the playground, very large bluestone slabs forming the stone wall, and stacked sections on the side of the lawn. All of these are used without attempting to mimic nature or recreate a natural landscape. Nevertheless, they evoke nature because they bring a new form and interpretation of nature into the city. 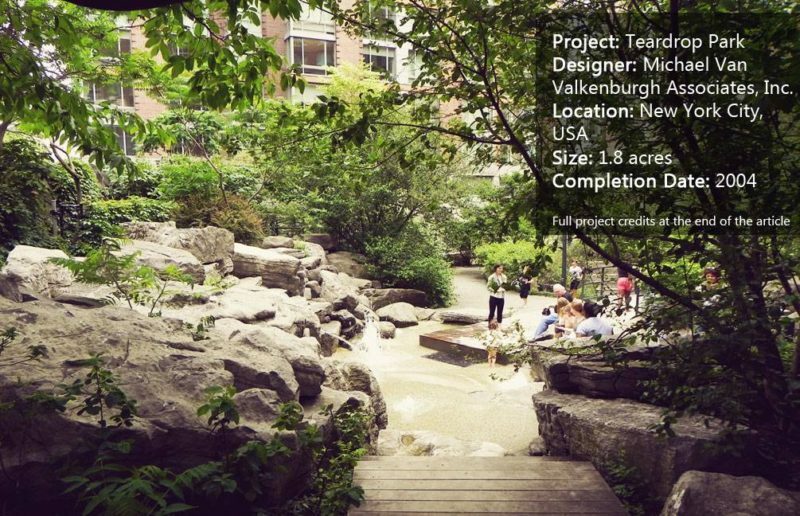 These are the result of a successful collaboration between artists Ann Hamilton and Michael Mercil with the landscape architect’s team. 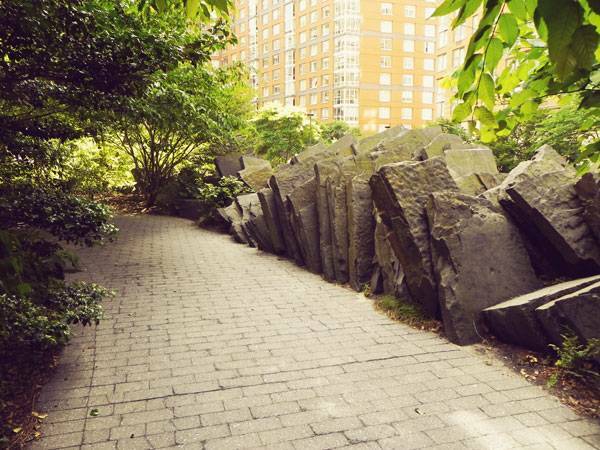 The artists created the installations of stacked bluestone slabs, called “geologic sections”, located on the east side of the lawn. 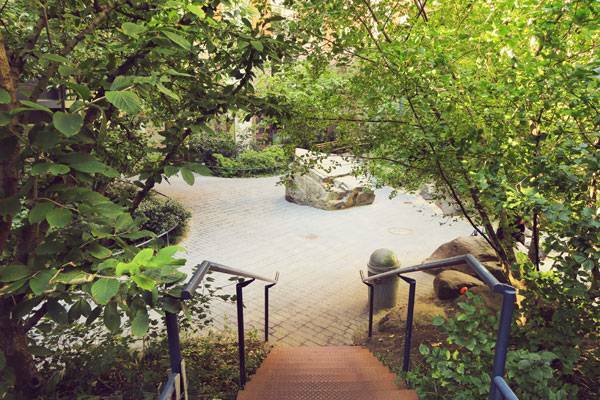 Stone as a main composition element is also used to link different areas of the park — in particular, the south end, which is separated from the main park by Murray Street. The stone in this area consists of large boulders used to create water features with appealing undulating surfaces and water effects. The use of stone in Teardrop Park feels appropriate to the location, because it connects this new space with the wider landscape of the region and also with other characteristic urban spaces in the city, such as Central Park, Innwood Hill Park, Prospect Park, as well as newer parks like Brooklyn Bridge Park and the recently opened hills on Governors Island. The space acquires narrative by using an element that is notably common to all these parks in the city. 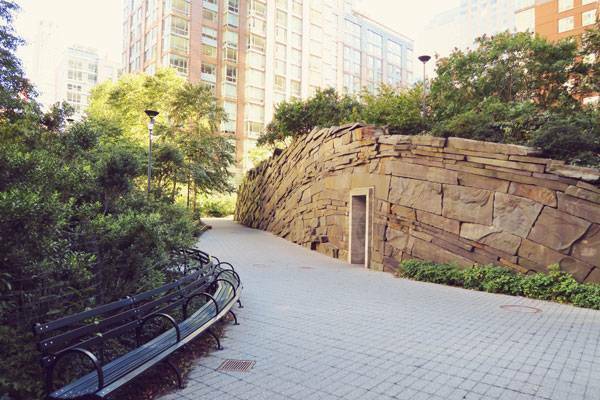 The large schist stone boulders that dot Central Park are one of the major recognizable elements of this iconic place in New York City — and so is the bluestone wall in Teardrop Park. 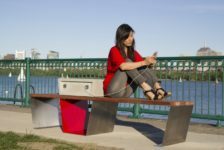 Another element that links Teardrop Park to other public spaces in the city is the choice of furniture and paving materials. The green “World’s Fair” curved benches, the concrete pavers, and even the bins seen in Teardrop Park are similar to the ones used in many other public spaces throughout the city. 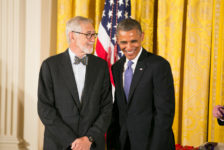 Even strict sustainability goals have benefitted the character of the park. 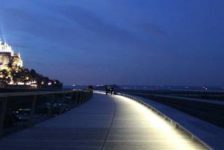 As a part of the larger 92-acre Battery Park City Park System, Teardrop Park was designed to meet a very high level of sustainability. 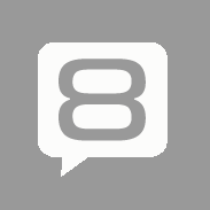 Every aspect of the design aimed to fulfill stringent green credentials. 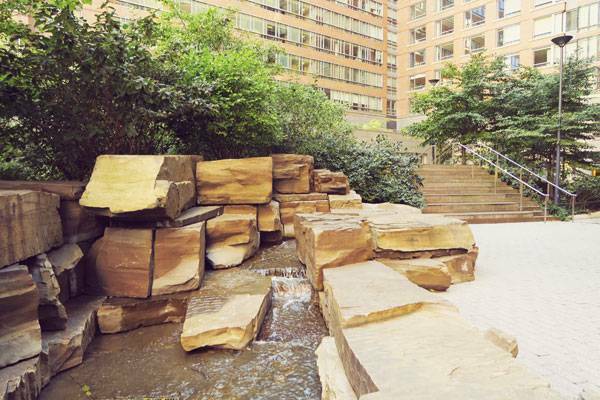 Battery Park City’s environmental requirements demanded 50 percent of all materials be sourced within 500 miles of the site (thus assuring rock used was characteristic of the region) and the use of at least 50 percent recycled materials. The park’s maintenance practices also take sustainability into account. For example, storm water is collected in tanks below the bluestone wall and used for irrigation, and greywater from the surrounding buildings is used in the landscape. Another requirement is to maintain the soft landscape without any fertilizers, chemicals, or chemical pest controls, an important aspect of maintenance since the park is used by children of all ages. 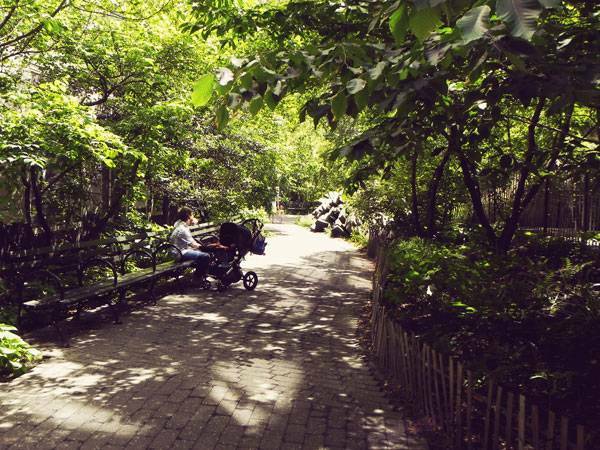 In urban environments, the connection between people and nature is often limited to their experience in urban parks, where they can witness natural materials and seasonal change in the landscape. 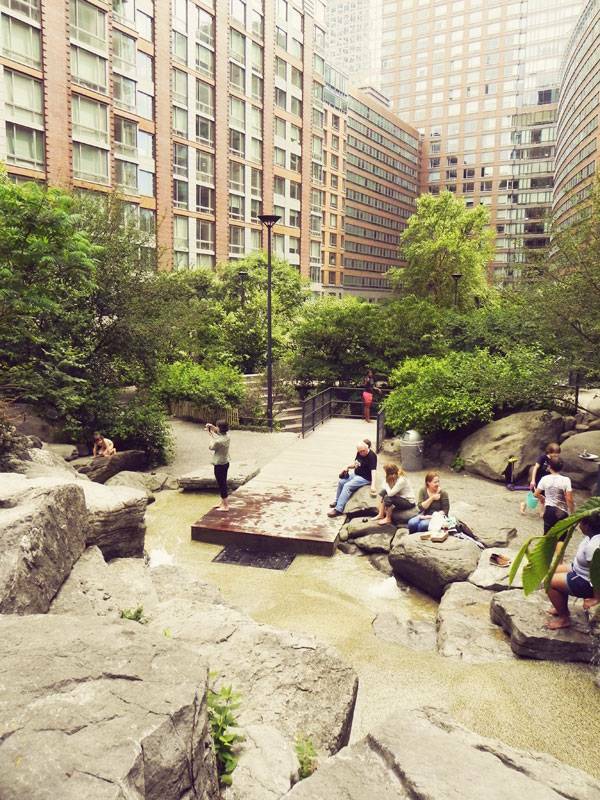 In Teardrop Park, the illusion of nature offers escape and takes the minds of users away from the city and the surrounding buildings. 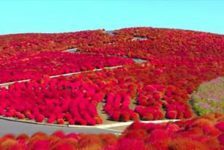 The thick planting that wraps around the park also plays a fundamental role, adding mystery and the opportunity for exploration and discovery. The playgrounds, except for a long slide in the sand pit, don’t have much in the way of typical play equipment, but instead invite children to experience natural materials such as sand, soil, water, timber, stone, and plants. On the southwest corner of the lawn, a miniature marsh area completely surrounded by trees and shrubs offers the perfect intimate environment for kids to engage with nature. The planting not only provides intimacy, it also creates drama with plants that enhance the seasonal change. In fact, many species used in the park provide stunning autumnal colors, including Cornus mas, Cotinus coggygrya and obovatus, Hydrangea quercifolia, Fothergilla gardenii, Hamamelis x intermedia, Koelreuteria paniculata, Lindera benzoin, Halesia carolina, Nyssa sylvatica, Quercus palustris, and a beautiful multistem Sassafras albidum tree planted at the edge of the mini-marsh in front of the lawn. Teardrop Park is successful because it is clearly well used. Through topographic variation, the park creates many different spaces, each with its own function and character. The tilted lawn feels open, while the playground is enclosed and protected. The views unveiled within the park are stunning and achieve drama through spatial depth. The design makes this park feel much bigger than it is, and the stone wall, with its stature and bold presence, helps to amplify this effect. 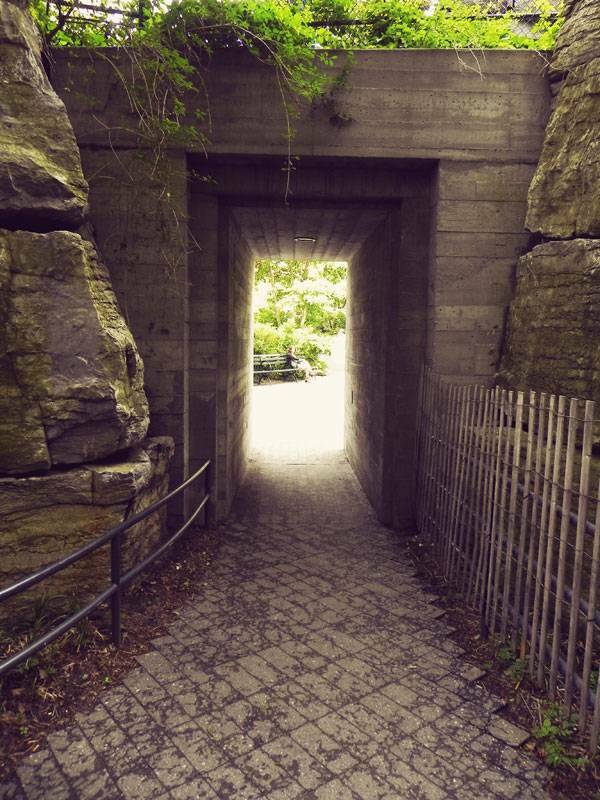 The view of the lawn through the concrete tunnel cut through the stone wall also makes the park appear much larger. 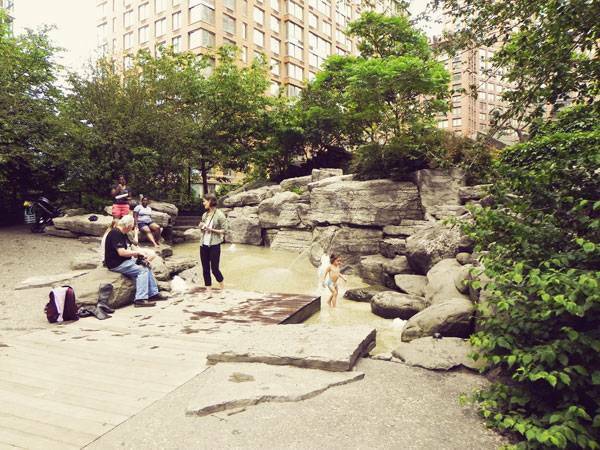 By differentiating the space in such an ingenious way, the park becomes appealing to people of all ages. If a place is used, even if it is new, it gradually gains character. People, with their very presence, contribute to the identity and character of a place, because by using it they convert the project into a part of the city. Teardrop Park is the ultimate proof of that. 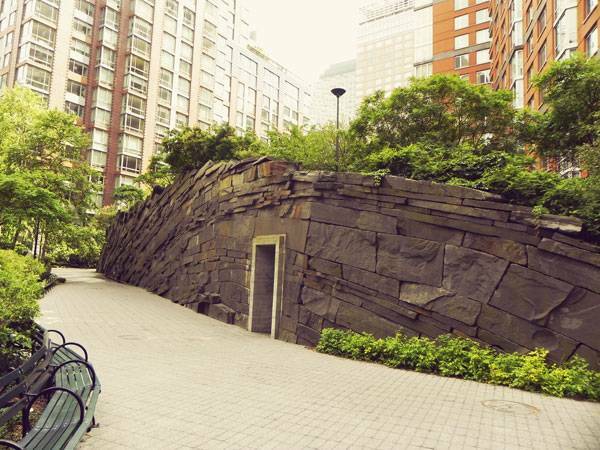 Teardrop Park shows how a well-used and loved space can be created even in the most unfriendly space. 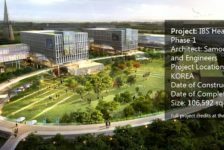 This project is a significant example of how to make the most of a difficult location, using the constraints of a site to orchestrate the park program. For instance, the amount of sun dictated where the lawn would be located. The playgrounds were placed in the more shaded and wind-protected area. Heliostats were installed on the top of buildings to reflect sunlight into the park, and even building’s heights were reduced to create the right environment for the lawn to thrive. 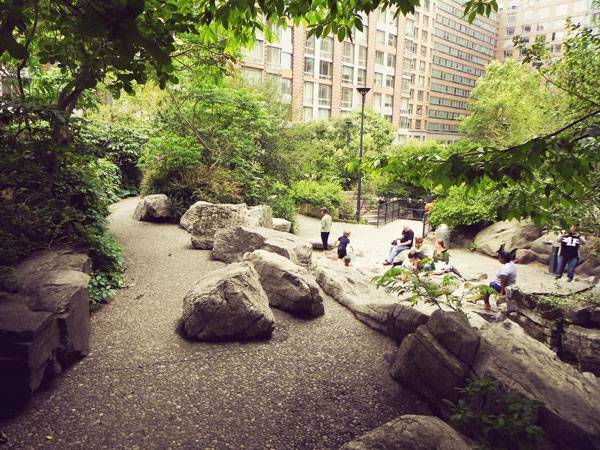 The project of creating Teardrop Park faced challenges very common in the landscape profession, especially when working in urban locations. 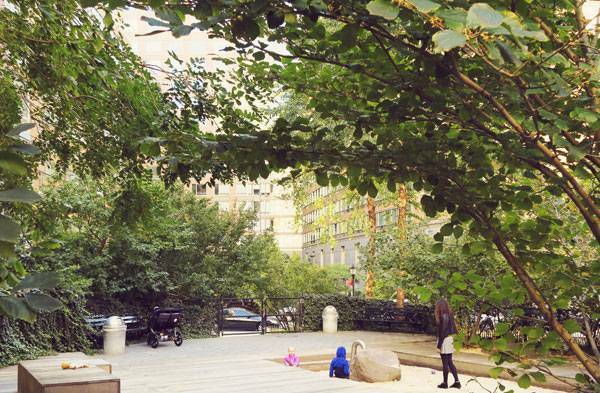 Issues of shade, wind, and water are here solved in a successful and engaging way, resulting in a remarkable project and a stunning example of successful park design and placemaking in a large city. 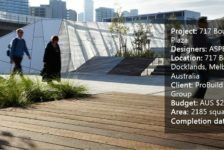 Is Bourke Street Plaza the Gateway to Melbourne’s Revitalized Docklands?